Little Tigers Ages 3 and 4 meet weekday mornings, late afternoons and Saturdays. 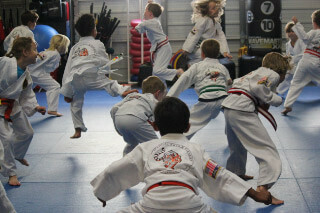 AK Martial Arts & Fitness offers 10 specialized classes per week for Ages 3 and 4 Karate for Little Tigers. Emphasis of this unique karate program utilizes martial arts and agility training that will strengthen self control and listening. Your little one will demonstrate increased confidence as we work on balance, coordination, motor skills and coordination in each class. Little Tigers learn how maneuver through fun obstacle courses, to stand in line and wait their turn, memorize Little Tiger Etiquette: helping Mom and Dad at home, showing kindness to sibling and friends, and being respectful with a positive attitude. Along with with some basic karate kicks and martial arts techniques, they will also have lots of fun and games. This program is renowned for building a foundation of discipline and dedication at home, school and at the Do Jang. Our Instructors are certified to teach this age group; using humor and positive reinforcement for learning and best results. We will also work with parents to help Little Tigers pay better attention at home and in public. “Watch, Listen, and Learn” methodology is utilized in every class. Our martial arts classes are small to provide quality instruction. Little Tiger classes for Ages 3 and 4 are held during weekdays in the mornings and afternoons as well as Saturday morning. Little Tigers can come to class 1, 2 or 3 times per week. Grab our awesome $29 Spring training deal of 1 week of unlimited martial arts training that includes a free uniform when you sign up as an AKMA regular student clicking here! Parents please note: We accept children starting at 2.5 year’s of age by invitation only. Call Do Jang for details. Tell Me More About Your Little Tiger Program!